Dr Richard Kelwick is an Royal Society of Edinburgh Enterprise Fellow and an entrepreneurially driven researcher, at Imperial College London, with expertise in both cancer biology and synthetic biology. 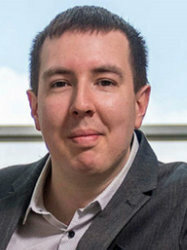 Dr Kelwick has a Ph.D. in cancer biology (Prof. Dylan Edwards group, UEA), during which he researched the protective roles of metalloproteinases in cancer. His research led to mechanistic insights into the protective roles of a disintegrin-like and metalloprotease with thrombospondin type motif 15 (ADAMTS15) in breast cancer. Upon moving to Imperial in 2013, Dr Kelwick joined Prof. Paul Freemont’s group (ICL DoM, Section of Structural Biology) where he developed expertise in cell-free synthetic biology. In particular, he generated several microbial and mammalian cell-free transcription-translation systems for cell-free biologics and biomaterials production. Moving forward, Dr Kelwick aims to apply his expertise in both cancer biology and synthetic biology towards understanding different aspects of exosome biology. >Successful entries in several business competitions (e.g. Techcelerate 2018, OneStart 2016 and Lean Launchpad 2015 with Steve Blank and Jerome Engel). Also, founding president of the UEA Enterprise and Engagement Club [2010 - 2012]. >Author of over 10 peer reviewed publications that span my research interests in synthetic biology and cancer biology. >External speaker at University of Cambridge, University of Oxford, several Kenyan research institutions, and at national and international scientific conferences (e.g. IET 2016, ECCSB 2017 – Switzerland). >A passion for science communication and public engagement. Interviewed on Persian TV (Manoto 1). Organised/or and supported events in the Science Museum, V&A museum, Tate Modern, Google London Campus, the Imperial Festival [2016; 2017] and at Harris City Academy Crystal Palace.